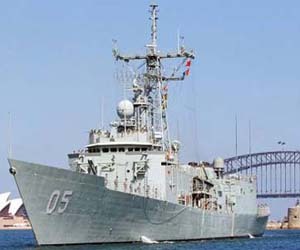 The frigate HMAS Melbourne is the latest warship from the Royal Australian Navy to serve with Combined Maritime Forces. MANAMA, Bahrain – The Australian frigate HMAS Melbourne arrived this week to participate in counter-piracy and maritime security operations with the 25-nation Combined Maritime Forces (CMF). The Adelaide class guided missile frigate left her home port of Sydney, Australia, in mid-August and will relieve Anzac class frigate HMAS Parramatta, which has been in the region since March. HMAS Melbourne has a ship’s company of 238 men and women. Additionally, 13 Australian service personnel are assigned to CMF Headquarters, Manama, Bahrain, fulfilling a diverse range of staff roles ranging from watchkeepers to legal advisors.